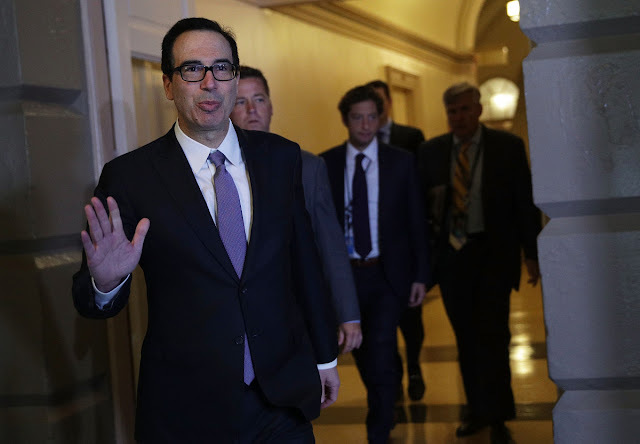 Earlier this week, ABC News reported that MTreasury Secretary Steve Mnuchin sought to use a U.S. Air Force jet to take his noveaux elitist trophy wife on a honeymoon to Europe. The report went on to say that for unspecified reasons Mnuchin decided not to use a government plane. His initial request is under review by the Inspector General. No one reported that he used a plane for his honeymoon, just that he requested one. there was no #FakeNews. Did Mnuchin really think he would be able to get away with this tweet? Twitter is tearing him up. Does Mnuchin completely lack in public relations savvy 101? Meanwhile, this clown is leading Trump's tax "reform" effort. Will he attempt to sneak in the costs of a trophy wife as a deduction?